Five items for $15? Yes please! Jordan Sushi is a new Japanese fusion restaurant that opened just a few months ago. Located on the busiest part of Lonsdale Ave. in North Vancouver, Jordan Sushi has managed to attract a fair share of diners. Wanting to try more than just the five items in the largest lunch plate, I asked my dad to help me out. After going around and around the restaurant for several eons searching for a parking spot (this is why I choose not to learn how to drive), we finally found a 60-minute spot in the shade just outside Loblaws City Market. It was time for lunch in a jiffy. I ordered the Lunch Plate D (the largest lunch plate), which came with five items for $15 (you can choose from a small list of items). Since I like sunomonos better than green salads, I went with the Sunomono, which came with an abundance of baby shrimp. The vinegar had enough of a kick, and the portion size was quite large. The sashimi came in good-sized cuts, and the Tuna Sashimi was adequately soft. 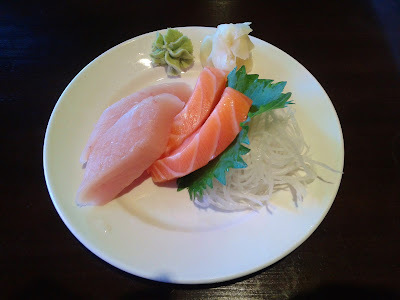 I found the Salmon Sashimi to be slightly fatty, although it had a nice, smooth texture. 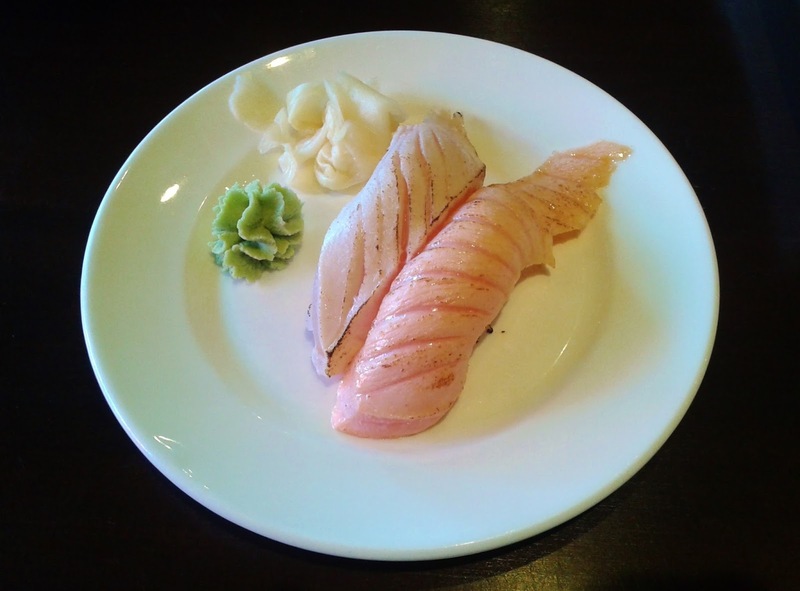 Both types of sashimi were mediocre in terms of freshness. Seeing seared sushi on the menu set off my ordering reflex (even though it was not part of the Lunch Plate D), and I tried the Seared Toro Sushi and the Seared Salmon Sushi. The Seared Toro Sushi had a juicy, mildly seared taste while the Seared Salmon Sushi had a smooth, creamy taste. Both pieces were only slightly seared, and the sushi rice was packed rather tightly. The Half Chicken Teriyaki was easily the highlight of the entire meal. The chicken was not only tender, but also had a brilliant, grilled flavour. 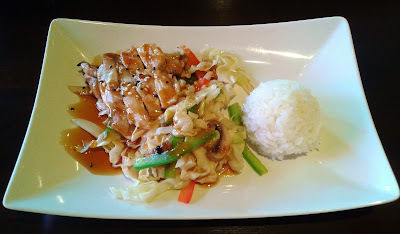 The amount of teriyaki sauce was just right and livened up the flavours of the chicken and the cabbage perfectly. The Jordan Roll and Las Vegas Roll happened to be listed as one item on the dine-in menu, allowing me to sample three different special rolls. 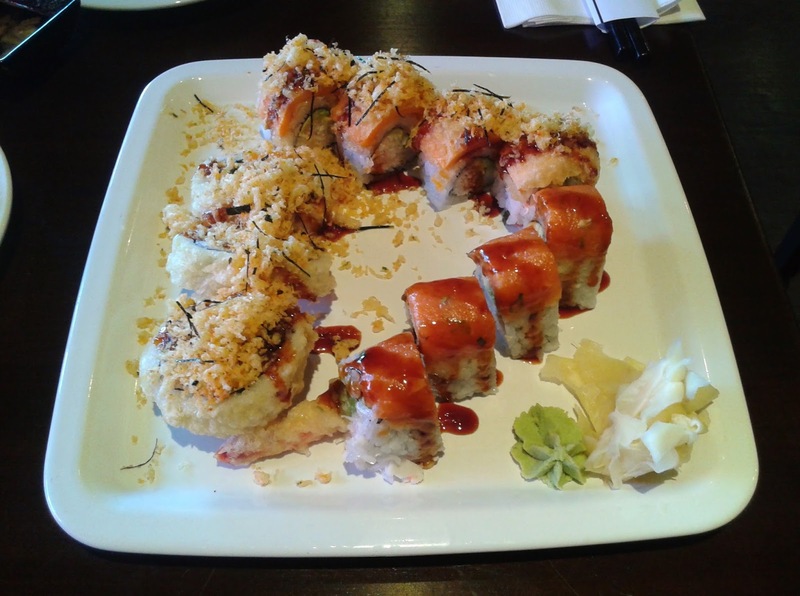 First up, the Lonsdale Roll (top) consisted of prawn tempura, a California Roll base, yam tempura, and crunch flakes. The California Roll base was neither very good nor very bad, while the yam tempura was adequately flavoured. The Las Vegas Roll (left) consisted of cream cheese, avocado, crab meat, and assorted fish. As much as I don't like cream cheese in rolls, I enjoyed the nicely melted cream cheese here. The roll, however, was a little too sweet. The Jordan Roll (bottom right), consisting of prawn tempura, crab meat, and spicy braised tuna, was the best out of the three. The tuna had only a hit of spiciness, but the prawn tempura was decent. There was a nice harmonized sweetness to the Jordan Roll. The Kushiyaki consisted of two skewers of grilled prawn and scallop with butter sauce. 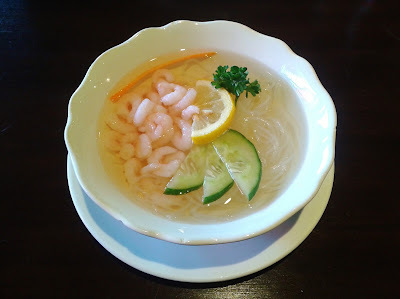 The prawns had a nice snap, and were conveniently peeled almost all the way to facilitate eating. The scallops, however, were tougher than expected. The addition of herbs and mayonnaise made the prawns significantly more tasty than they otherwise would have been. The waitress maintained a friendly attitude during my visit, but the service was rather sparse. However, Chef Jordan came out into the dining area at the end of my meal to wave to all of the guests! It was amusing to see how much he looked like the caricature on the restaurant's website. My dad and I were quite satisfied with our meal and the lunch specials made the meal quite inexpensive. 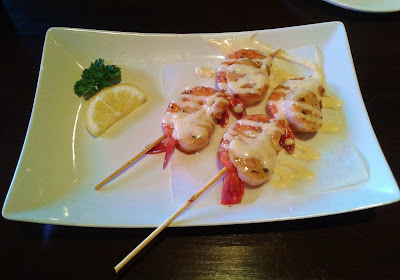 Jordan Sushi has a slight edge over its nearby counterparts in both the quality of the food and the ambience. Great review, Raymond! Lovely photos and presentations, too.